Cut long strands of vegetables with a spiralizer and toss them into a simple Spiralized Salad – tender-crisp, fresh, and easy to eat! I’m not a fan of the “zoodles/courgetti” concept. Summer squash and pasta are radically different foods, which provide different nutrition and meet different needs. On the other hand, I have long known that various ways of cutting vegetables create interest – you change the texture and the whole feel of the food when you change the cut. So I have been curious… But not curious enough to get a big awkward gadget with limited use. But now, I am cooking for Rich’s parents. And they are in their nineties, with (between them) an assortment of typical aging issues. And that of course affects my cooking. Inhabited Kitchen always concentrated on seasonal food, seasonal vegetables. Back in New York, I would be picking up my first CSA share tomorrow – a few greens, some spring vegetables, not much yet, in New York… Now, though, I will concentrate on the season of my life, not of the year. Now the most important thing for me is to cook the food the parents need, want, can and will eat… They want their out of season tomatoes and salad – I serve them. They do not want cooked greens – I do not serve them. So – bite sized food. Single bite sized, not what I’ve been calling that, which are more two-bite… Some mashed and pureed food (though not so much that it gets boring…) Above all, moist food, it’s easier to swallow… (“Think of a peanut butter sandwich” the therapists say to me. 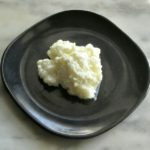 “Adding moist jelly makes it easier to eat.”) I have previously commented that the parents like sauce, and assumed that it was because it added flavor. Well, that’s one reason, but so is the liquid – I now serve some kind of sauce or gravy with most meals. And a spiralizer lets me give them raw carrots that are easy to eat. 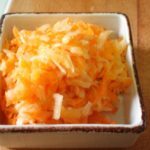 I already had, actually – I have made them Ginger Carrot Salad, with grated carrots, and they like it. 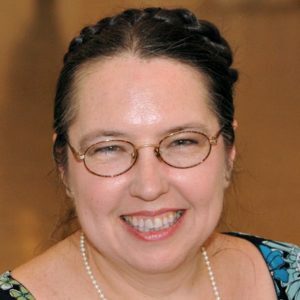 But I like options… And as summer heats up, I will want to serve cold vegetable dishes, and indeed entire cold dinners. The salad is pretty simple, really. I took one medium zucchini, and one smallish carrot, and you can definitely change those proportions… I just wanted a little chewiness with the softer squash. Put the zucchini though the spiral gadget, on the thicker setting. (And you know – you could use the julienne blade on a mandoline, or just cut it in very fine strips with a knife… It won’t be exactly the same, but it will work.) Cut the pile in half with a big kitchen knife, to make it more manageable. Well, I cut it in quarters, which does still leave some long shreds, but makes it all easier to eat. Then put the zucchini in a bowl, and sprinkle just a pinch of salt over it. Stir that in. It will draw out some of the water naturally in the vegetable, to keep it from going soggy. 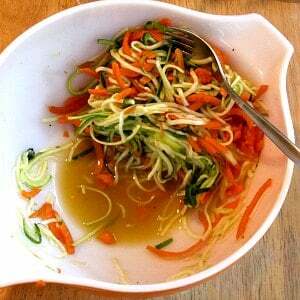 Let the zucchini sit while you spiralize the carrot, on the thin setting, then cut the pile of carrot as above. Then toss it with the zucchini, and let it all sit fifteen minutes or so. You will see the liquid collect in the bottom of your bowl – drain that. Now, I do not think this salad will keep well, unlike many of the vegetable salads I make. 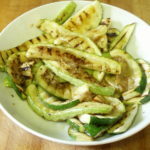 The zucchini is perceptibly softer even by the end of the meal, from the continuing action of the salt, and I think it would be mushy by the next day. 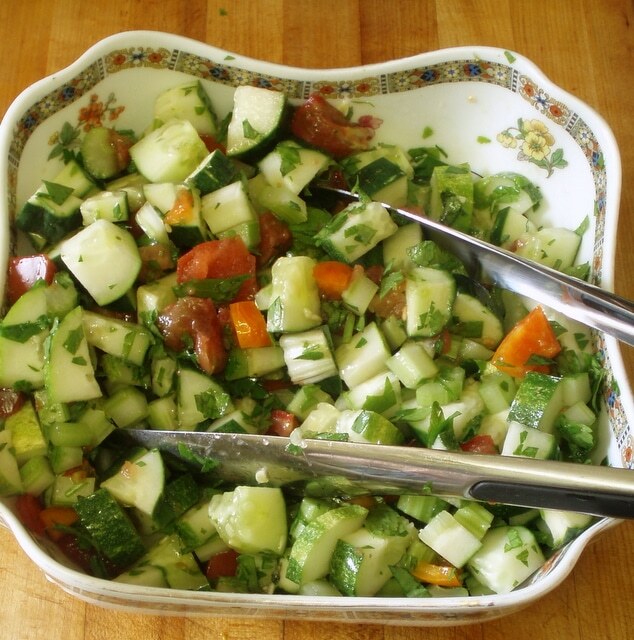 But it is easy to make in small amounts, and it was lovely fresh, just enough different from other salads. Cut long strands of vegetables with a spiralizer and toss them into a simple Spiralized Salad - tender-crisp, fresh, and easy to eat! 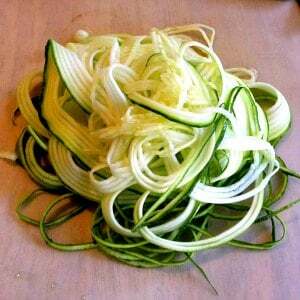 Spiralize zucchini. Toss with salt, and set aside. Spiralize carrot. Add it to zucchini, and toss. Let rest for 10-15 minutes. Drain off collected liquid. Add oil and vinegar, toss well. Let rest for 10-15 minutes during the recipe preparation. 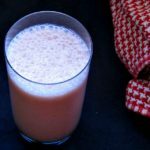 This is such a simple and healthy recipe. I hope your older family members liked this dish. Thanks for sharing! I broke down and bought one too! I'm glad I have it though because I used to do spiralize with a Julienne peeler, which make it very labor intensive. 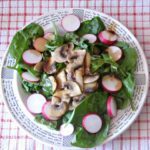 Your salad looks delicious and nutritious! Perfect for the summer! 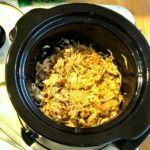 This recipe makes me want to whip out my spiralizer! It looks so fresh and healthy! Awe! 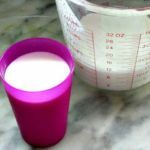 I love the simplicity of this recipe!! I bought a spiraler last year and I've just stated using it. I make zucchini noodles for spaghetti. But that's it! That's all I've made lol! So your recipe will be a good one for me to try! 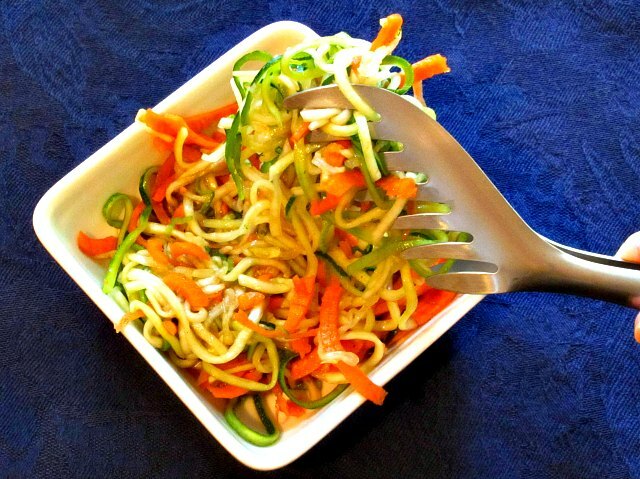 I'd never have thought of using raw zucchini noodles in a salad but I'm curious to try it. I'm always on the lookout for healthy recipes like this. Easy, healthy, colorful, and so delicious! 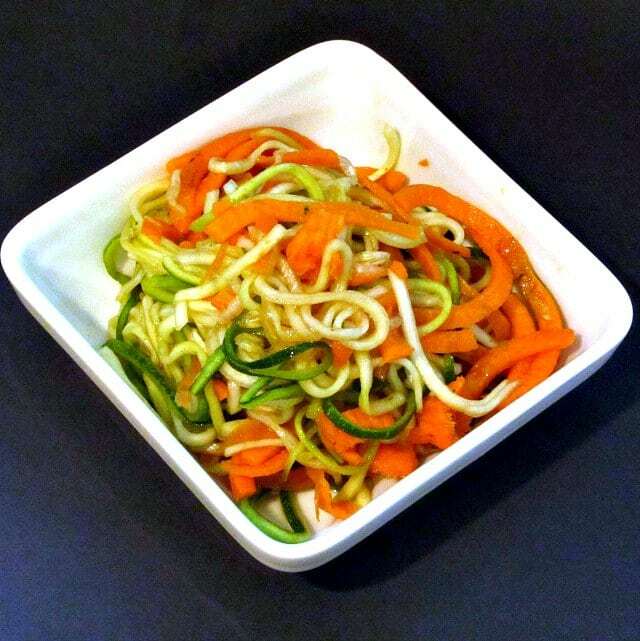 Yes, the spiralizer can be addictive ;-) . I love a good salad and this looks so healthy and delicious. 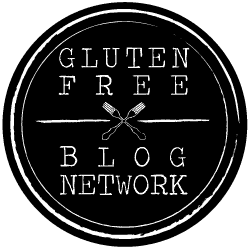 Gives me the perfect excuse to use my spiralizer!! 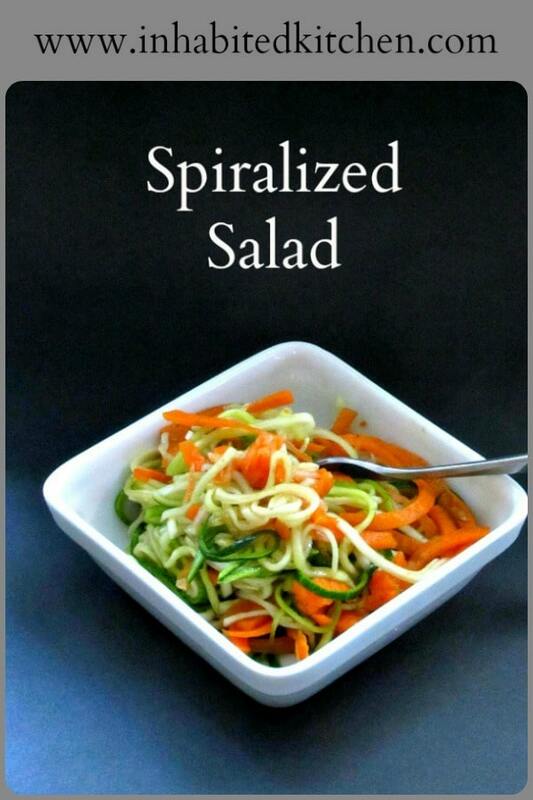 I'm going to get a spiralizer, your salad looks so pretty and it would make for such a great presentation. I agree with you, spiralized veggies and pasta are two different things, but I do love to spiralize my veggies - just another way to enjoy vegetables.